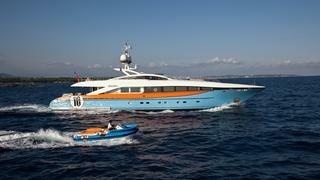 The first Baglietto MV13 superyacht launch, Lap 1, has splashed. Built for none other than former Fiat manager and Gucci collaborator Lapo Elkann, it’s no surprise this yacht has a cool paint job. Designed by Francesco Paszkowski and customised by Garage Italia Customs, the design is inspired by military underwater assault vehicles. 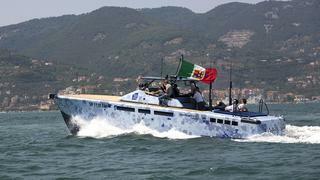 The customised yacht tender's Italia Independent digital camouflage paint job is actually created by hand painting five different shades as well as applying a transparent matte lacquer. The owner of Aurelia's fandom is obvious by looking at the exterior of his 37 metre Heesen yacht. Aurelia has a hard-to-miss, custom paint job designed by Dobroserdov Design to mimic the Gulf Porsche Racing colours. Even better, the superyacht's tender is designed to match as well. The car theme doesn't stop on the outside; each stateroom features a different racing theme and leather trimmed like the finest sports car dashboards. The owner of Aurelia's fandom is obvious by looking at the exterior of his 37 metre Heesen yacht. Aurelia has a hard-to-miss, custom paint job designed by Dobroserdov Design to mimic the Gulf Porsche Racing colours. Even better, the superyacht's tender is designed to match as well. The car theme doesn't stop on the outside; each stateroom features a different racing theme and leather trimmed like the finest sports car dashboards. The 35 metre yacht Guilty is a Pop Art dream that would make Roy Lichtenstein proud. Designed by American artist Jeff Koons, the wild exterior paint job is matched by an artsy interior. Whether observing her eye-catching paint job from the outside or enjoying the cool, gallery like interior, guests will feel like they are surrounded by high art on the high seas. The 35 metre yacht Guilty is a Pop Art dream that would make Roy Lichtenstein proud. 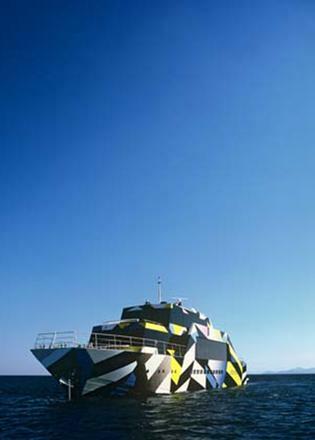 Designed by American artist Jeff Koons, the wild exterior paint job is matched by an artsy interior. Whether observing her eye-catching paint job from the outside or enjoying the cool, gallery like interior, guests will feel like they are surrounded by high art on the high seas. Privacy is key, and sometimes a yacht owner wants to blend in and go unnoticed. What better way than a camouflage paint job in hues of blue to match the sea? 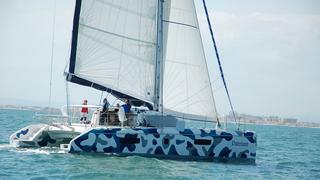 The catamaran Waterland from Outremer Yachting tried this trick. We hate to break it to them, but she actually stands out more than the rest of the white-hulled yachts! Privacy is key, and sometimes a yacht owner wants to blend in and go unnoticed. What better way than a camouflage paint job in hues of blue to match the sea? The catamaran Waterland from Outremer Yachting tried this trick. We hate to break it to them, but she actually stands out more than the rest of the white-hulled yachts! 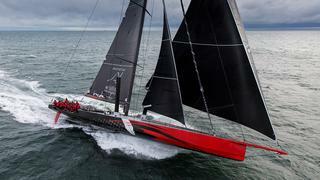 Sailing superyacht Comanche, launched by Hodgdon Yachts, is designed to be a warrior on the race course, so it's no surprise that her paint job matches her aggressive performance. The black and red design is intimidating, sure to make her competitors quake, and complemented by her fierce spinnaker sail. 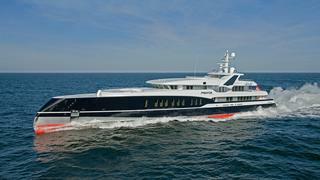 The 73 metre Feadship-built Predator would automatically turn heads just with her axe-bow design. Launched in 2008, she got in on this trend before it was trendy. But what makes Predator really stand out is her clever paint job used to complement her exterior design. Instead of a ho-hum all-white hull and superstructure, the bold design is taken to the next level with deep blue hull paint, red details and white superstructure, which work together to enhance her exquisite form. The 73 metre Feadship-built Predator would automatically turn heads just with her axe-bow design. Launched in 2008, she got in on this trend before it was trendy. But what makes Predator really stand out is her clever paint job used to complement her exterior design. Instead of a ho-hum all-white hull and superstructure, the bold design is taken to the next level with deep blue hull paint, red details and white superstructure, which work together to enhance her exquisite form. Get on board with this pirate-inspired design or be prepared to walk the plank. High-performance centre console builder Midnight Express launched the 12 metre yacht, appropriately named Black Pearl, back in 2002. The totally custom superyacht tender features an air-brushed paint job by Dave Hunter at Invisions Design. Full of pirate details, the bespoke Midnight Express 39 even has a wind-ravaged black "sail" flying from her bimini top. 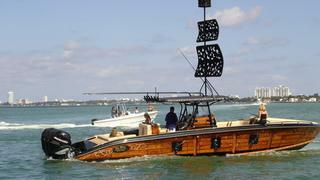 Get on board with this pirate-inspired design or be prepared to walk the plank. High-performance centre console builder Midnight Express launched the 12 metre yacht, appropriately named Black Pearl, back in 2002. The totally custom superyacht tender features an air-brushed paint job by Dave Hunter at Invisions Design. Full of pirate details, the bespoke Midnight Express 39 even has a wind-ravaged black "sail" flying from her bimini top. The logic behind painting your fishing boat to look like a shark raises the question – wouldn't this scare more fish away than attract them? 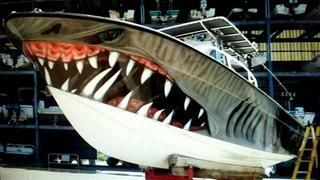 Logical or not, this toothy paint job is certainly one of the wildest ones on the water. Making use of the shape of the deep-V centre console hull, the shark's mouth is open wide and ready to take a bite of its prey.